1.7 How to Apply Online for Telangana VRO VRA Vacancies? VRO VRA Notification TS 2017 is soon going to be released by Telangana Public Service Commission. Through the TS VRO VRA Recruitment 2017 Notification, the TSPSC will recruit 1506 Village Revenue Officers & Village Revenue Assistants. Candidates who are looking for government jobs in Telangana can check the eligibility criteria for TS VRO VRA Jobs. Aspirants who have met the eligibility conditions can apply for VRO Jobs in Telangana through online before the last date. Are you in search for Latest Job Notifications in Telangana? At last, you are on the right page. Here, we have attached the Upcoming TS VRO VRA Notification 2017 details. Interested candidates can check the Telangana VRO VRA Recruitment 2017 Notification carefully. Telangana Public Service Commission will soon issue TSPSC VRO VRA Notification 2017 for the recruitment of 1000 VRA’s and 700 VRO’s in Revenue Department. The Commission is going to hire the eligible candidates for the Village Revenue Officers and Village Revenue Assistants posts. As per the notification, the minimum age limit of the applicants must be 18 years and the maximum is 40 years. Candidates who have completed 10th/12th class are eligible to apply for Telangana VRO VRA Jobs. The VRO VRA Notification 2017 TS details such as eligibility, application form, fee, important dates, etc are covered here. Before applying for the VRO Jobs, candidates can check the Telangana VRO VRA Notification 2017 details carefully. TS VRO Jobs News Update on 1st August 2017: Telangana job Aspirants are advised to refer Telangana/TS VRO and VAO Jobs Eligibility Criteria. Fill the Latest Telangana PSC VRO VRA Jobs 2017 Online Application Process before the closing dates. Telangana Government is going to release a TS Revenue Department Notification 2017 for the appointment of the additional staff in Chief Commissioner Land Administration (CCLA), Stamps and Land Registration and in Revenue Department. The recruitment process is going to be started immediately. A total of 21 Junior Assistants in CCLA office, 8 Deputy Collectors, 38 Deputy Tahsildars, 7 District Registrars, 22 Sub-Registrars, 1000 VRA’s, 700 VRO’s, 400 Junior Assistants/Typists, 110 Surveyors, 50 Computer Draftsmen, 50 Junior Assistants in Registration offices, 100 Deputy Surveyors. Telangana Public Service Commission will take up the recruitment process for the above posts and these vacancies are to be filled through the direct recruitment. We have enlisted the Latest Telangana VRO VRA Vacancy 2017 Details in the below sections. Also, refer the Telangana/TS VRO and VAO Jobs Eligibility Criteria before filling the application form. Aspirants who are willing to apply for www.ccla.cgg.gov.in Telangana VRO VRA Jobs can check the eligibility details such as qualification, age limit, etc through the below sections. For Village Revenue Officer Posts: Candidates must have passed 10+2/Intermediate/12th class conducted by Telangana State Board of Intermediate Examination. For Village Revenue Assistant Posts: Aspirants should have completed 10th/SSC conducted by Telangana State Board of Secondary Education. As per the VRO VRA Notification 2017 TS, the age relaxation is applicable for the reserved candidates as per the rules and regulations of Telangana Government. 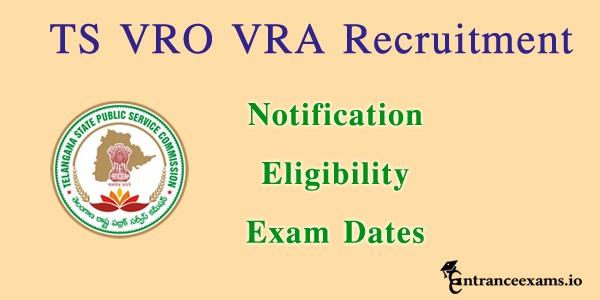 The VRO VRA Notification TS details such as selection process, salary details, application fee details, etc are provided below. SC/ST/Women candidates have to pay the concerned application fee through online/offline mode as per VRO VRA Notification TS. Applicants can pay the registration fee through Me-Seva, E-Seva, Credit/Debit Card. How to Apply Online for Telangana VRO VRA Vacancies? On the home page, search for the VRO VRA Notification TS 2017 link. Click on the notification link & read the details carefully. Then search for “TS VRO VRA Recruitment 2017 Apply Online” link & click on it. Now, fill the VRO VRA Application Form with your details. Select the District, Mandal, Village, etc. You are willing to apply for TS VRO VRA Jobs. Then enter the journal number & pay the application fee through E-Seva/Mee-Seva. Click on the submit button & take the printout of the VRO VRA Apply Online form for future reference. The information provided on this page regarding VRO VRA Notification TS is for the convenience purpose of the candidates looking for the release of the notification. We will also update here the further details of Telangana VRO VRA Jobs soon after the official announcement. So, we advise the contenders to stay tuned to our site entranceexams.io for more updates regarding Upcoming Government in Telangana. Refer the official portal also for further information of VRO VRA Notification 2017 in Telangana. WHEN WILL START DOWNLOAD APPLICATION SIR?